Three-dimensional or 3D cell cultures are newly developed vital tools used in cell biology research, drug discovery, and tissue engineering. In comparison with the usual 2D cultures, these tools provide images that are structurally more similar to the natural microenvironment, enabling researchers to get more prognostic and physiologically significant information. 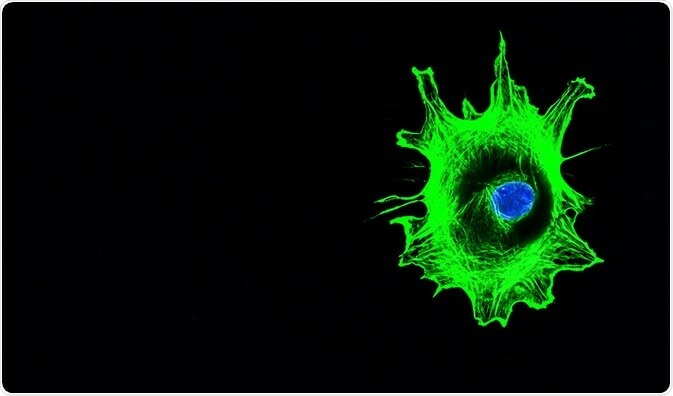 Various types of 3D cultures as well as scaffold materials are available, among which Matrigel, which is formed from extracellular matrix of mouse sarcoma, is the most widely used. Based on the culture’s optical characteristics, thickness, type, and information needed, various 3D imaging techniques are utilized in visualizing the culture. 3D cultures, which are generally thick as well as increasingly scattered, prevent light from penetrating into the sample without substantial alteration. In order to visualize these cultures without causing any destruction to the samples, epi-illumination-based imaging techniques that rely either on the identification of fluorescence or the detection of backscattered light, are more appropriate. To view a fluorescent marker that is targeted to a particular molecule or area in the sample, fluorescence-based techniques are used. In this technique, the autofluorescent properties possessed by the tissues or cells enable the identification of structural and organic components by providing adequate contrast. Light scattering-based techniques are mostly used in analyzing the dimensional and structural features of the sample. A few imaging techniques can also be used concurrently to give a more broad view of the sample depending on divergent mechanisms that enhance the contrast. The three main techniques used in visualizing the architecture of the samples in a 3D culture are confocal microscopy (CM), multiphoton microscopy (MPM), and optical coherence tomography (OCT). To analyze the location and functions of a cell for more than a few days in a chitosin scaffold, CM as well as OCT can be used, whereas to acquire high-resolution images of cells cultured on 3D micro-topographic substrates or cultures using Matrigel, OCT and MPM can be used. Confocal microscopy (CM) can be defined as a high resolution imaging technique that allows optical sectioning of relatively thick, nontransparent samples. It is used in reflectance mode and fluorescence mode. Since scattering defocuses the illuminating beam, the CM’s depth of penetration is limited to approximately less than 100 µm. While reflectance CM does not require any stringent wavelength, fluorescence CM uses light of shorter wavelength and excites fluorophores through absorption. To enhance penetration depth in reflectance CM, light sources of longer wavelengths can be used. In this technique, the spatial resolution is influenced by the numerical aperture (NA) of the microscope’s objective, size of the pinhole as well as the light’s wavelength. Also, the depth of penetration is relied on the sample’s optical properties along with the NA of the objective and wavelength of the light used. Confocal laser scanning microscopy (CLSM) is the most widely used technique in life science among the various kinds of CMs available. Multi-photon microscopy (MPM) is a fluorescence imaging technique that can be used for achieving deeper depths of penetration. In this technique, optical properties that are nonlinear are used to absorb more than two near-infrared photons. Consequently, a visible single photon is emitted, which, based on the type of tissue, allows the optical sectioning at high resolution; here, the sample thickness can be up to a millimeter. MPM makes use of photons in high intensity in a specific time and position, helping to restrict the absorption inside the focal volume. Also, the limited volume for fluorescence excitation leads to the reduction of photobleaching. The benefits of MPM over CM are many, especially in thick and highly scattering samples; due to the use of near-infrared lights in exciting the fluorophores, penetration is better in MPM. Also, the thermal effects as well as absorption are significantly low in this technique. Optical coherence tomography (OCT) is a 3D imaging technique similar to ultrasound imaging that can be used to acquire scattering-based visuals of high resolution for thicker cell or tissue samples. It has the capability to penetrate depths of several millimeters. In this technique, a near-infrared light of broad bandwidth is focused into the sample and the time taken by the light to reflect back to a detector is calculated. This time is used to determine the depth at which the light is scattered. Cross-sectional images are created via scanning the beam throughout the sample and obtaining depth-dependent scattering details at each spot. Optical coherence microscopy (OCM) is a variant of OCT which is capable of providing greater depth of penetration than CM. A few other variants of both OCT and OCM permit imaging of the samples based on distinct contrast mechanisms. Spectroscopic OCT and OCM, optical coherence elastography, and Doppler OCT are some other variations of the technique.